April 17. The visibility of the convert option will take a number of weeks to roll out to all customers. In the meantime customers can manually convert to the unified Routing setting. The automatic conversion process will not occur earlier than June 5. We will follow up closer to the date and have updated the G Suite release calendar. 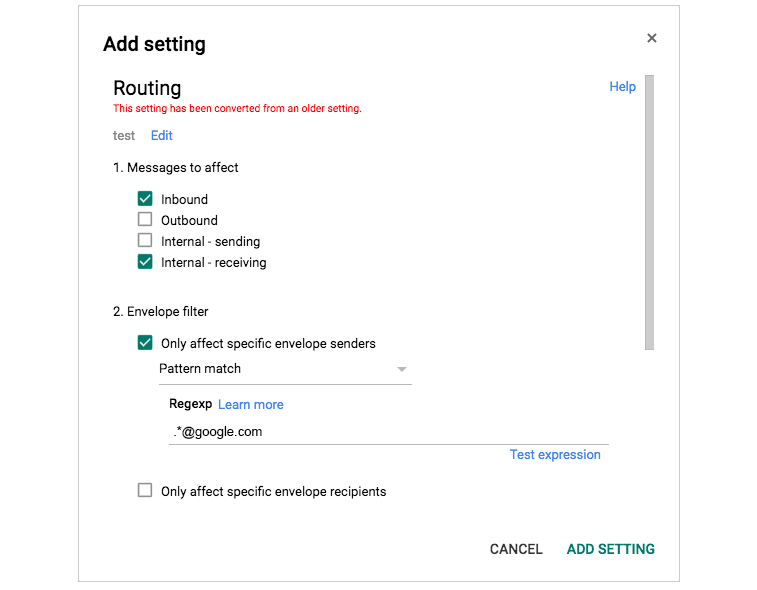 G Suite customers use Gmail because it's simple to use and reliable, and because it allows them to customize their enterprise-specific routing settings in the Admin console. However, as we expanded these features to cover more use-cases, it became clear that a consolidated view of all routing settings would make it easier to manage at a glance. That's why today, we're beginning to unify Gmail's routing settings in the Gmail Routing section of the Admin console that was launched one year ago. Beginning week of January 23, 2017, your existing Sending routing, Receiving routing, Catch-all address and Domain-level routing settings will become read only. These settings are still active, but in order to make changes, you must click the CONVERT button, next to the existing rule. We've taken steps to make this process as simple as possible by converting the previous setting and mapping it to the new fields automatically. The converted setting is then placed in the unified Routing section, where all of your rules can be managed from one place. The old setting will no longer be visible in the old user interface, so you don't need to clean up old rules afterward. To make changes to an existing routing setting, click the CONVERT button next to the rule. Since the user interface has changed slightly, we suggest re-familiarizing yourself with the new look and feel. To add new routing settings, use the Routing section from Gmail's advanced settings section. The previous way to create routing settings will soon be removed. To migrate your existing rules to the new section ahead of time, you can use the CONVERT button for all of your rules. If you decide not to make any changes to your routing rules, then your rules will be automatically converted to the new Routing format and section on June 5, 2017. Settings converted to read only on both Rapid release and Scheduled release week of January 23, 2017. Automatic routing settings conversion occurring after June 5, 2017. The option to convert existing Sending routing, Receiving routing, Catch-all address and Domain-level routing settings will return no earlier than April 17. The visibility of the convert option will take a number of weeks to roll out to all customers. In the meantime customers can manually convert to the unified Routing setting.